Unique handmade leather wallets for men. We’ve go a wicked combo of black shark skin and deep powder blue croc skin in our latest offering. Pair that with a black croc leather interior and you’ve got a one of a kind mens wallet that’ll turn heads. Some combinations of exotic skins just work, there’s something about this mix which ticks all the boxes. 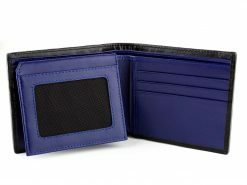 Rugged yet stylish as well as striking yet understated make this wallet great for any event or casual daily us. 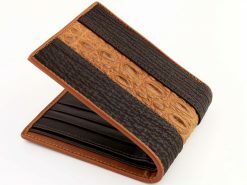 Get yourself one of these handmade leather wallets and be part of our exclusive signature series. I was looking for a unique wallet and found this website. With so many incredible choices, it took me over a month to narrow down my choice to this wallet. When the wallet arrived it far exceeded my expectations. It is very well crafted, absolutely beautiful, and looked exactly like the picture. I have only had the wallet for a week, and quite a few people have complemented me on the wallet.